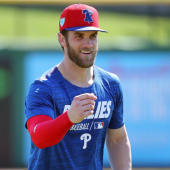 Hunter was shut down for two weeks due to a Grade 1 flexor strain in his right elbow Tuesday, Jim Salisbury of NBC Sports Philadelphia reports. If Hunter is able to return after just two weeks and if his spring proceeds without setbacks, he could still have a chance to be ready by Opening Day, but that may be a best-case scenario. The Phillies acquired a number of relievers over the offseason, so they can afford to let Hunter take things easy and open the year on the injured list if they're not 100 percent confident in his readiness.